Youngest of four sons born to a Daddy who was 19 years old when Wyatt Earp died, I was considered the runt of the four by my three brothers, even though I was 6’6” by the age of 16. We were a winter vegetable farming family in southeast Florida, growing mainly peppers, cucumbers (“cukes”), eggplant and the like. 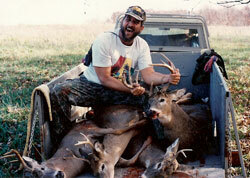 All of us were also avid outdoorsmen from the start and Dad was bigger and stronger than any two of us. He came from the ‘old school’, was raised at the foot of Lookout Mountain in north Georgia in the teens and 20’s of the last century, and moved to south Florida with his two mules in 1929. He worked those mules together by hand for years to clear land he farmed, which is why he was bigger and stronger than any of the rest of us. There’s lots more to that part of my story, but I thought that much was worth mentioning for this hunting blog. Dad taught us brothers many things about deer hunting in swampy areas of south Florida, along with many tricks about how to efficiently self-process deer meat to turn most of it into “back-strap-like-eatin”. My cousin Lee who still lives in Georgia and has a cabin at the foot of Lookout Mountain also has had a hand in my learning. Over the years I’ve been able to share some of that knowledge with other members of CPHC, including the next generation of CPHC hunters coming along, but I’m getting ahead of myself a bit already. By the time I came along, times they were ‘a changin’ as Bob Dylan wrote 50 years ago this year. What a poet he was. I was 9 years old when he wrote that song and its lyrics still ring true today. It’s always been one of my favorites. I was a bit different than my brothers, graduating from high school in 1973 and going through a varied college experience in that era. I ended up with a degree in broadcasting from the University of Florida. I first thought I wanted to be a forest ranger, thinking I could then sit in a tower and spot deer all day most of the time. But somewhere along the way things went a different direction. I went from Lake City Community College to Florida State University in 1976, and then overseas a few months later with FSU’s foreign study program in Firenze, Italy, spending six months there to earn my ‘minor’ in language and the arts in 1976. I like to say it’s where I got my culture. As is often the case when we grow older, I had no idea how good life really was back then. My how times change, and ‘things’ seem to change with them! Spending the first nearly eight years of my professional career at Florida Farm Bureau, I got involved in nearly every department of its communications division. I started out even before graduation as an intern, and initiated a syndicated farm radio market report program while there. In that time period around the late 1970’s I met CPHC blogger extraordinaire Chuck. I first hired Cindy, the lady he would later marry, and then I hired him, both as interns at first and later full time to help with the market radio reports and some other audio visual stuff we initiated at Farm Bureau. They were both also working on their own degrees in broadcasting at UF at the time. Looking back, those were grand times too, lots of hard work but lots of fun, and we learned a great deal. Things we did and contacts we made in those early years would later influence all of us and our careers a great deal. Jumping ahead, the three of us left those jobs at the same time in 1984 to create the first ever independent farm radio network in Florida in 1984. That job exit and business venture experience is a complete “nuther story” that would take volumes to tell, so you won’t be reading about it in this blog. Things rocked along, times changed, challenges affected the new original venture and all of us along the way, and Chuck and Cindy married and started a family through those early years too. There were some hard time for the new venture after a Christmas freeze in Florida hit our seed capital investors hard, they were mostly all farmers, and the freeze ended up turning our original venture upside down. The two of them soon moved away to become key players at the nation’s largest farm network in the Midwest for ten years or more, and I stayed to keep working on the original farm network concept. I started over pretty much from scratch with the help of the lady who would later marry me, and since then the network has grown into AgNet Media, which now involves farm network activities in four states, citrus and pest control industry magazines, and a small book publishing company, all focused on agriculture media in some way. Although Chuck and I lived in different parts of the country for many years, we never lost touch and continued developing a close friendship. 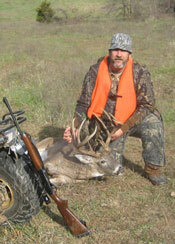 Chuck and I deer hunted together on the same Missouri ranch for 21 years. Those were great hunting years, during which Chuck’s brother Paul later joined in bringing his two oldest but still young sons into the hunting mix too. As I recall, we needed something to encourage the boys to help with camp chores, so the “Crystal Pig” award was thought up and that’s when the concept for this hunt club was born. 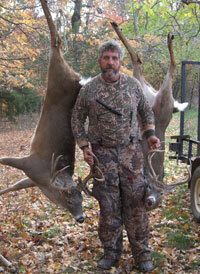 That Missouri hunt produced some great hunting, and a few decent trophies for most of us too, except for host Chuck whose wall hanger continues to elude him. But we had great times, almost always good hunting and plenty of meat for the freezers until the guy who owned the ranch, (Derry Brownfield, the founder of Brownfield Network where he worked in Missouri) died just three or so years ago. Derry was an independent thinker too, a good guy, a great host, and a fantastic story teller. Since that time, with Chuck and Cindy having moved back to Florida and Paul and family living in north central Georgia nowadays, we’ve found this new clear cut lease and are working to establish the new and improved CPHC on this plot of Georgia ground. So anyway, that’s a snippet of my story. Chuck’s been after all of us for a while now to write some kind of Bio for this blog, and that is where I will leave this one. It’s a quick stream-of-thought writing that I hope passes the muster test of Our Blogging Master Chuck, who truly has become a master at this new technology all around. To my CPHC hunting brethren then, namely, Paul and the Boys, I throw down the gauntlet of challenge for them to take a bit of time to share their stories too, so we can get Chuck off our backs and get down to business. There’s spring work to be done on the new lease and camp there, hunting plots to work on, and seed to put in the ground not too far after that. It’ll soon be time to kill something fellas, we’re already behind on the workload too, so LET’S GET TO IT! (And yes, I know I have a famous name, but that too is an entirely different story!